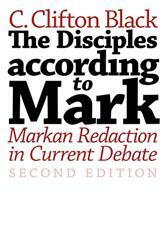 A few weeks back I failed to point out that my review of the second edition of C. Clifton Black’s classic, The Disciples According to Mark: Markan Redaction in Current Debate, was published in the most recent fascicle of Biblical Theology Bulletin. As one who tries to keep current in my field, I am nearly always reviewing a book, though I rarely take the time to mention any of them here. However, in this case I wanted to mention the review not only because I regard Black’s book as a work of serious import, but also because it has survived long enough to see a second edition, which I think is a good thing for a future generation of Markan scholars. (Not many of us can say the same thing about our own published dissertations!) When it was first published in 1989 (originally by Sheffield Academic Press), Black’s book was credited with delivering a near death-blow to the agenda and practice of redaction criticism. The content of the original remains the same but this volume includes a lengthy afterword in which Black reflects on developments within Markan research in the 25 years since his important work first appeared. If you are really interested in the recent history of Markan scholarship, you can read my review here (which may not be necessary), or you can buy the book here (which probably is).